This Down Under utility cruiser has a lot of amenities packed into a midsize, easy-to-handle package. 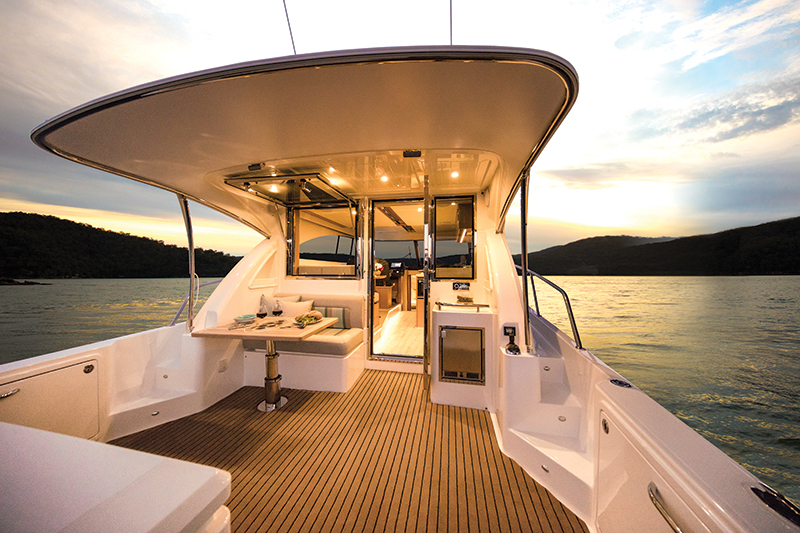 The Sanctuary Cove International Boat Show in Australia offers a special experience for marine enthusiasts willing to make the trek. Hosted every Memorial Day weekend in a resort village and marina adjacent to the Intercontinental Hotel, this world-class show provides a sneak peek of new Australian boat models destined for the U.S. This is precisely why I endured the 15-hour flight to attend this year’s show. 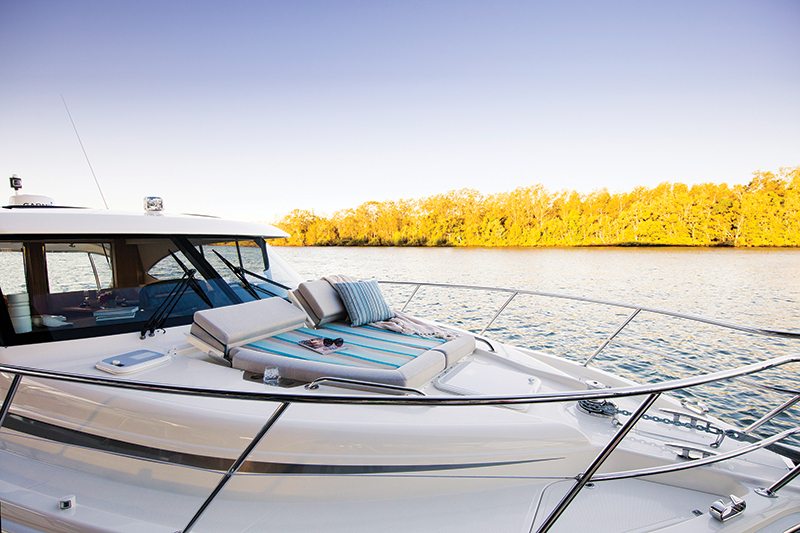 Riviera is the largest Australian boat builder, and its factory in Coomera is right up the road (and the river) from Sanctuary Cove. Riviera started in 1980 and three years later began exporting boats to America. This year two new Riviera models were introduced at the Sanctuary Cove show: the Riviera 72 Sports Motor Yacht, the largest boat in the Riviera line, and the Riviera 395 SUV, the smallest of the builder’s popular SUV series. I was able to test both vessels. 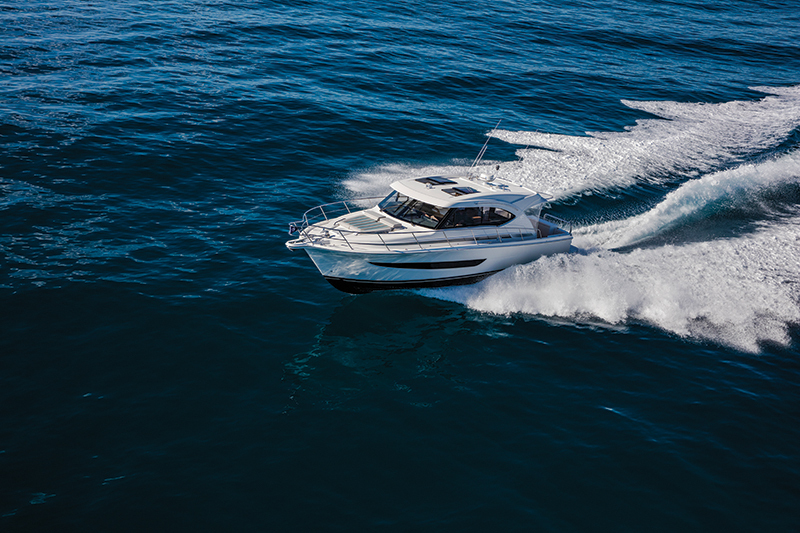 The 72 is a large and impressive boat with powerful engines and a lot of accommodation space, but the 395 SUV really caught my attention because of how much it offers in a relatively compact size. Some swim platforms are simply an access point to the cockpit, but the Riviera 395 SUV maximizes space and utility, including taking full advantage of this area. A dinghy on Snap Davits is attached to the aft end, maximizing exploration possibilities and providing convenient and accessible storage. Across from the dinghy, built into the transom is a purpose-built pullout storage area designed to hold an outboard. Above this area and accessed by flipping up a lighted lid is a sink with a food prep area and a grill that can be used when a gas outboard is not stored in the transom. This setup makes it easy for occupants to converse with others seated in the cockpit or at the galley door. The platform is also equipped with a large stainless guardrail, so the grillmeister won’t step back from the grill and wind up in the water. For planned swimming outings, a foldout stainless swim ladder makes reboarding easy, and a hot and cold deck shower facilitates rinsing off the salt. Our test vessel had a fish-cleaning station and rod holders at the top of the aft rail that spin out when the dinghy is deployed. Up a step is an ample cockpit with optional foldout seating available on both sides. 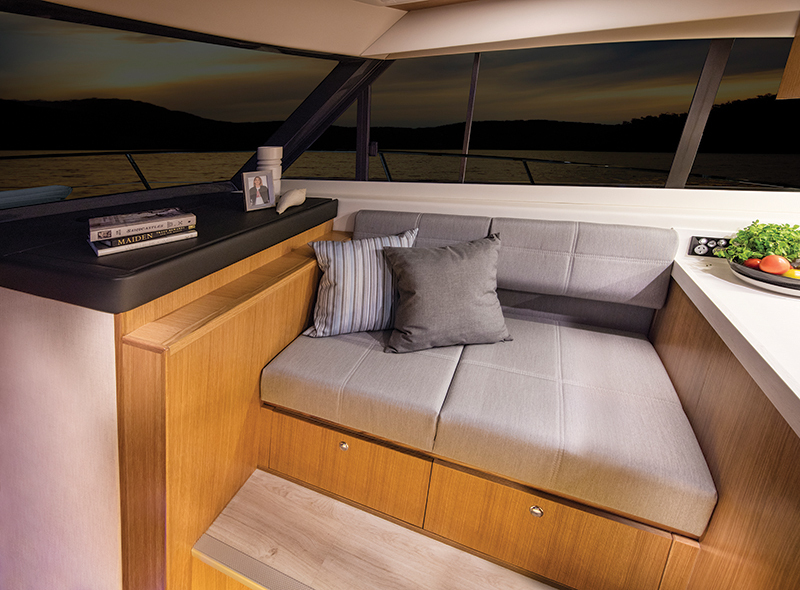 Along the forward bulkhead is an aft-facing seat that conceals a cooler compartment below. Its table is unique in that it turns athwartships for dining but can flip to face fore and aft to provide easier access, and it has stainless drink holders underneath for cocktail time. The seating, which is situated under the awning that extends the hardtop, has access, via a popup window on a hydraulic actuator, to the main dining area inside. Other cockpit amenities, standard and optional, include fishboxes beneath the sole, storage along the gunwales, an ice-maker and an IPS joystick docking station to starboard. The engine room is beneath the cockpit sole and is accessed via a hatch near the salon door. The equipment is thoughtfully laid out, and despite limited headroom, critical functions can be accessed. Through the stainless and smoked-glass cockpit door, the galley is to starboard and up one step is the portside dining area. Forward of the dining spot is the double helm seat, and opposite it is a setee that is also raised, so all of the seating provides good visibility even while the boat is running. There is a TV on a lift under the windshield ahead of the starboard settee, which means passengers can’t watch TV while underway, but who would want to anyway? The layout works for entertainment purposes and while underway. 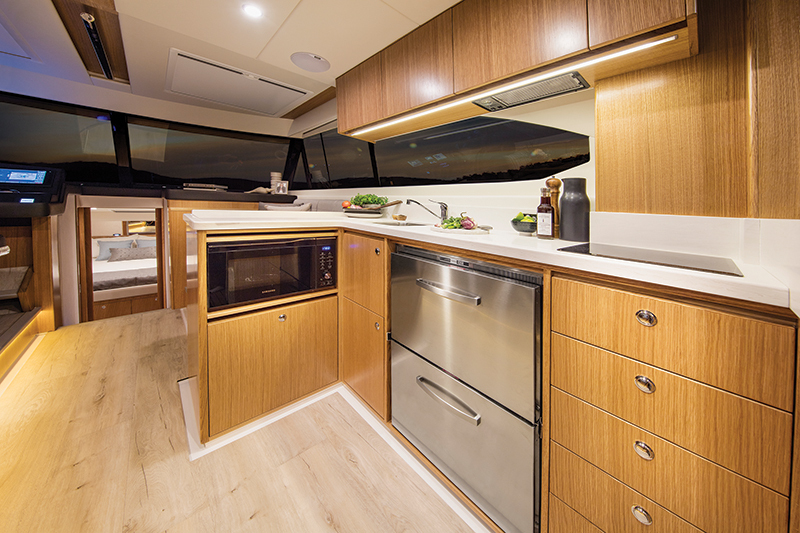 The galley is equipped with twin refrigerator drawers, a microwave/convection oven, and a single-burner electric cooktop and has excellent proximity to both the cockpit and salon dining area. The double helm seat puts the driver’s seat to port along an opening side window and under one of two skylights. Critical controls are laid out ergonomically surrounding the helm. The adjustable wheel is leather clad, solid and comfortable. Throttles and the joystick are to port, along the window. They’re easy to reach, but some drivers might find the arrangement a bit awkward at first. I got used to the left-hand throttles quickly, and the IPS joystick’s placement just ahead of the throttles allows for easy access during docking whether the operator is facing forward or aft. Visibility aft from the helm is very good, or the captain can use the cockpit station during docking. At a little less than 6 feet tall, I found the headroom adequate and the visibility good while standing, but since the helm is a step up from the salon, taller people might have to stand slightly to center to take advantage of the extra headroom the sunroof provides. Acceleration was smooth as the twin Volvo Penta D6 IPS500s gently lifted the boat onto plane. There was no perceptible “hole” it had to dig out of, and the boat remained balanced while exhibiting only a slight bowrise. I live in the Pacific Northwest where logs are prevalent, so forward visibility is paramount, and it was excellent on the 395 SUV. We made reciprocal runs in the Broadwater, which is a protected waterway, because conditions outside the breakwater were severe. I am confident the boat would have been fine, but we didn’t want to risk covering the boat with salt spray, since prospective buyers were due to test it when we were done. It topped out at 31 knots, and the best fast cruise was 24 knots, where the 370 hp diesels were burning a combined 28.7 gph, yielding a little less than 1 mpg and a range of just more than 300 miles, which is roughly the range from 24 knots to 29 knots (about 3100 to 3500 rpm). Those are respectable numbers for this type of cruiser on a boat that is easy to handle, agile and fun to drive. After running our numbers we had to head back, so I took the time to check out the cabins below. 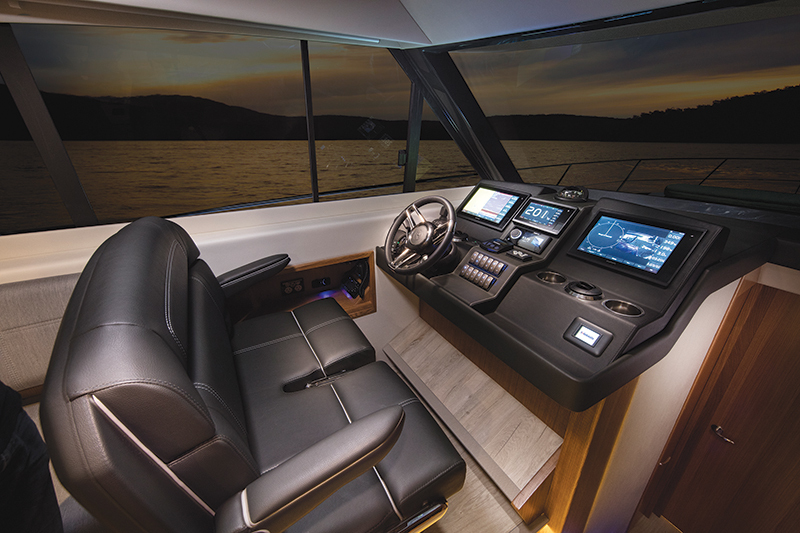 The master is forward and features a center island berth with convenient walkaround access, a full-length hanging locker, hull windows forward and an overhead hatch for ventilation. The head is in the corridor to starboard and features a separate shower compartment complete with a bench and shelves for shampoo and soap. The guest cabin is full beam but with moderate ceiling height, since it runs under the salon. It is configured as three single berths but a filler can combine two of the singles into a double. When a couple is using this cabin, the third bed becomes a nice sitting area with better headroom. A hanging locker completes this cabin. As we slowed to idle speed in the calm waters, I made my way to the foredeck. Ample sidedecks with a raised gunwale and a stainless rail with a lower center cable offer plenty of outboard protection; a handrail along the cabin top is a nice safety feature. The foredeck has a large sunpad with bolsters aft that prop up the seats and triple drink holders on either side. This provides yet another congregating area. An anchor windlass and lockers are forward and feature room for fender and line storage. Whether an owner is heading to Catalina for the weekend or cruising for a week or more in Mexico, the San Juan Islands or up into Canada and Alaska, the Riviera 395 SUV has a lot to offer. It has comfortable and well-laid-out accommodations for a couple or a family of four or five. 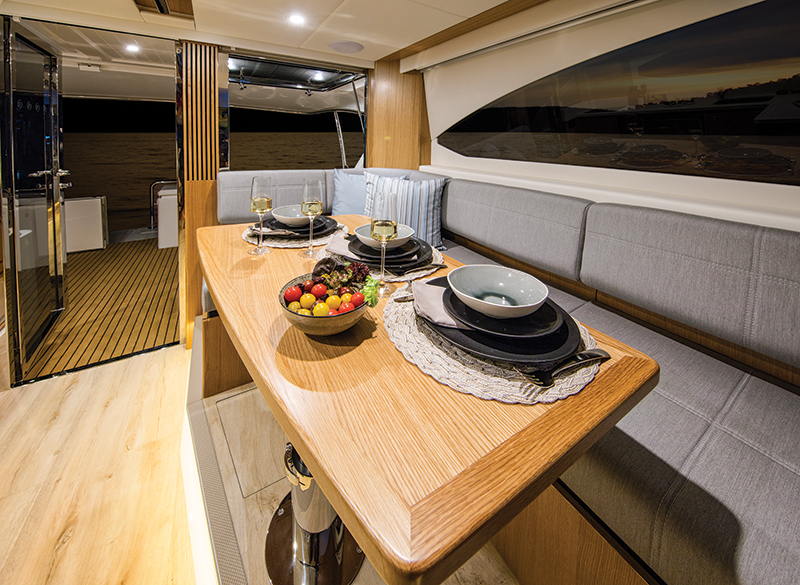 It even has enough space for two couples in separate private cabins and enough room for kids to sleep in the salon when the galley table is converted to a berth. I wondered aloud what else Riviera had in store. It did not take long for Stephen Milne, Riviera’s brand and communications director, to explain that a flybridge version of this boat, the Riviera 39 Sports Motor Yacht, will be coming soon. LOA: 43 ft., 6 in. Beam: 13 ft., 9 in. Draft: 4 ft., 7 in. Twin 370 hp Volvo Penta D6 IPS500 diesels, helm joystick, C-Zone digital switching, electric cooktop, microwave/convection oven, twin refrigerator drawers, transom grill w/sink, fishbox in cockpit sole, Onan genset, Vacuflush head, shower stall and more. Cockpit joystick, 27,000-Btu AC, trim assist, stateroom TVs, cockpit ice-maker and awning, fresh- and saltwater transom washdown and more.